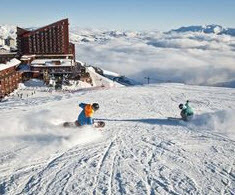 Tours de Sport Hot Deals: SAVE 15% OFF ALL SKI WEEKS AT VALLE NEVADO WHEN YOU BOOK DELTA FLIGHTS! SAVE 15% OFF ALL SKI WEEKS AT VALLE NEVADO WHEN YOU BOOK DELTA FLIGHTS! Save 15% on your Valle Nevado stay when we book your international flights on Delta! This is an incredible opportunity to get some summer turns in at Chile's largest resort. With a ridiculous amount of early season snow, make this your year to ski Valle Nevado! Must provide proof of purchase of international airfare on Delta Air Lines. Good for any dates during Valle Nevado's season, from June 24 to September 25. Valid for all of Valle Nevado's hotels and condominiums. Condominium rentals do not include lift tickets or meals. Valid for double occupancy and single occupancy. Reservation minimum of 3 nights. Can not be combined with another promotional offer. 15% discount not valid for airfare on Delta Air Lines.